Please be aware that this product has been superseded by the Track T4. The Track Trailer Topaz Hybrid / Caravan was the first of its kind. Its journey starts as far back as 2003 when Track Trailer first built it’s AT Range of off-road caravans. 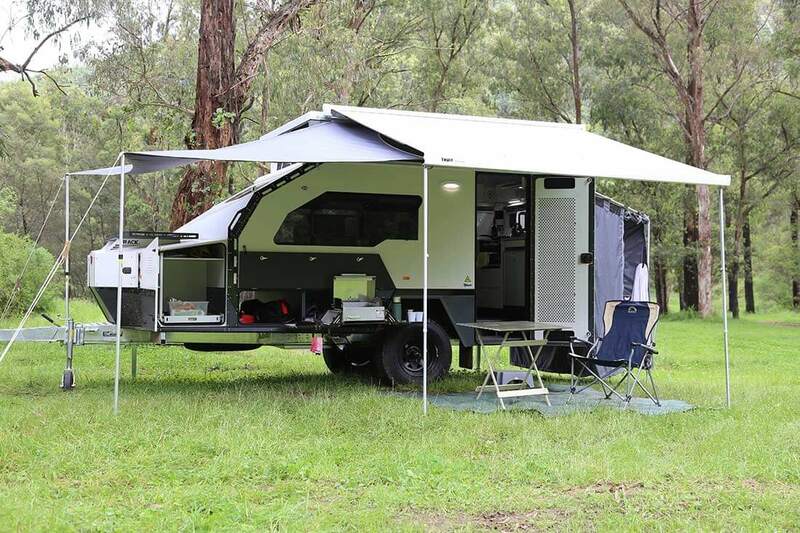 This idea was refined over the subsequent years by listening to customer feedback and testing various internal layouts to find the most practical blend of Caravan / Camper Trailer creating the Hybrid. The Topaz was officially released in 2008 and it immediately struck a chord with enthusiasts seeking serious off-road capabilities mixed with a little luxury. Its striking 2 two tone colour scheme and bold external skeletal structure has became the benchmark which all other manufacture’s have followed. Today the Topaz is in its third design phase and boasts a broad array of class leading features in a dependable sheet-metal body built on Track Trailer’s own Military MC2 Suspension. 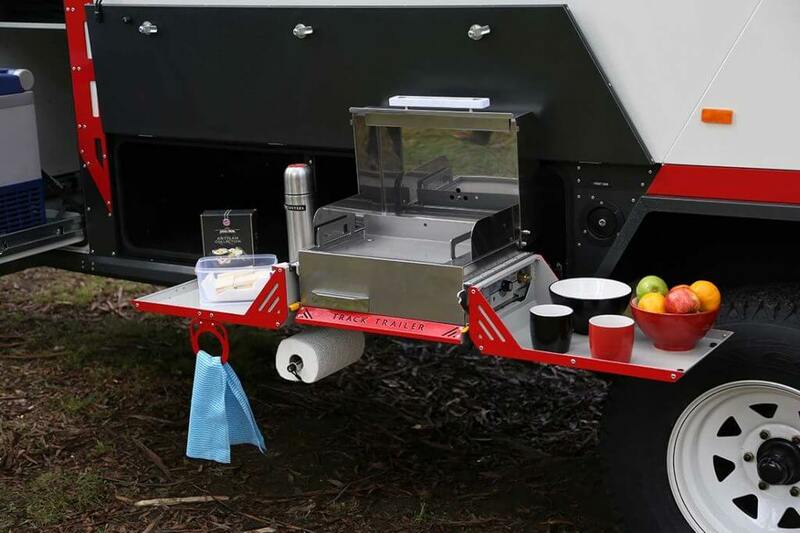 Track Trailer has a genuine military history and a reputation designing and testing products to suit the Australian outback. 3 years on body and build, 5 years on chassis and suspension. Warranted for off-road use. Built by Australians for Australians. All profits stay here and enrich our community. 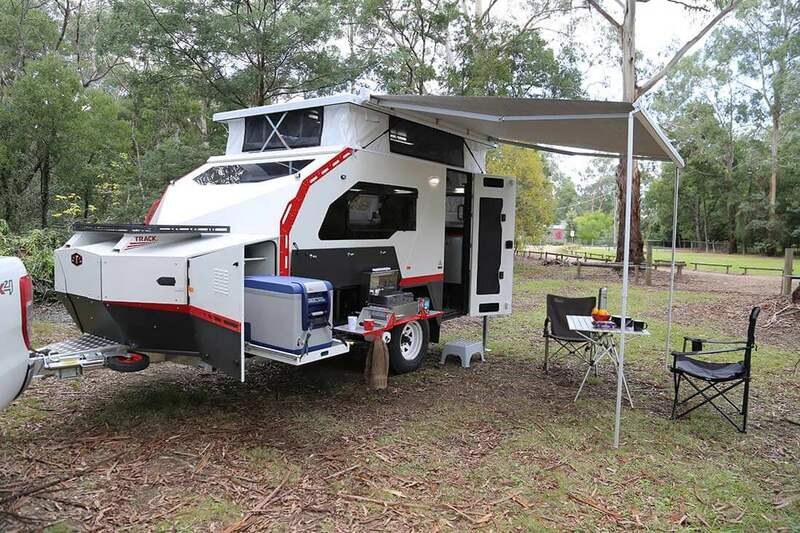 The Topaz Savannah was a finalist in the “hybrid” category of the Off-Road Camper Trailer of the Year awards in 2016. The Topaz Hybrid / Caravan Advantage! * Content refers to both features and options available on Topaz. Please refer to the models section for specification and options list for accurate inclusions. Pop the top and you are set up in seconds! 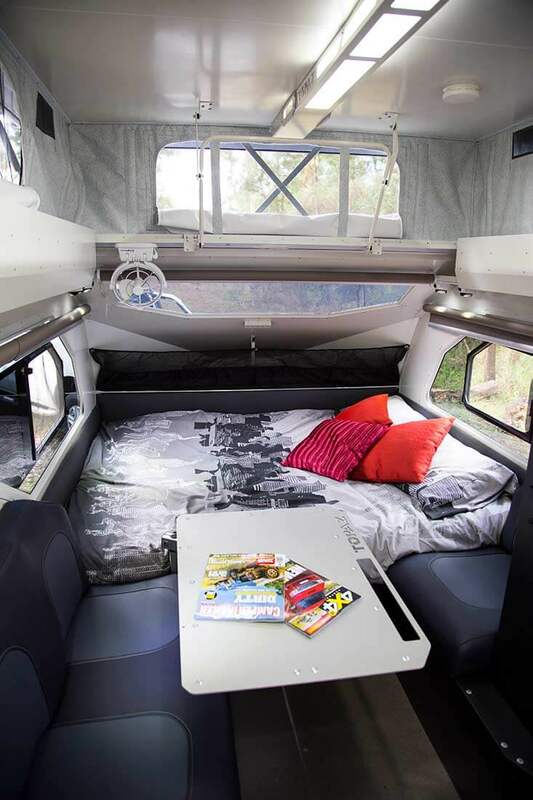 Pull up trackside for lunch and the Topaz’s living space can be accessed without needing to pop the top. The full height door features a large built-in security screen which complements the opening windows around the bed area. The kitchen features easy to clean, full height bench tops and plenty of usable storage in the form of slide out drawers, which are built ‘military tough’ to withstand corrugations. 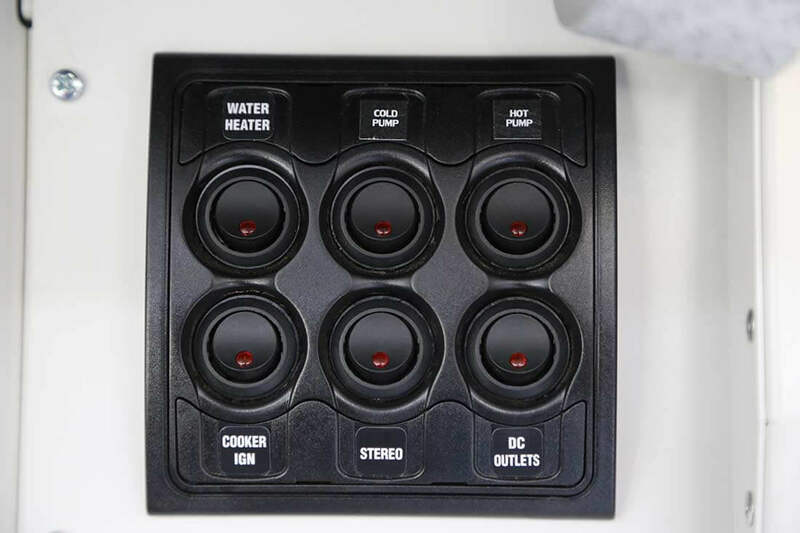 The standard gas cooktop and grill is complemented by a permanently fixed rangehood. 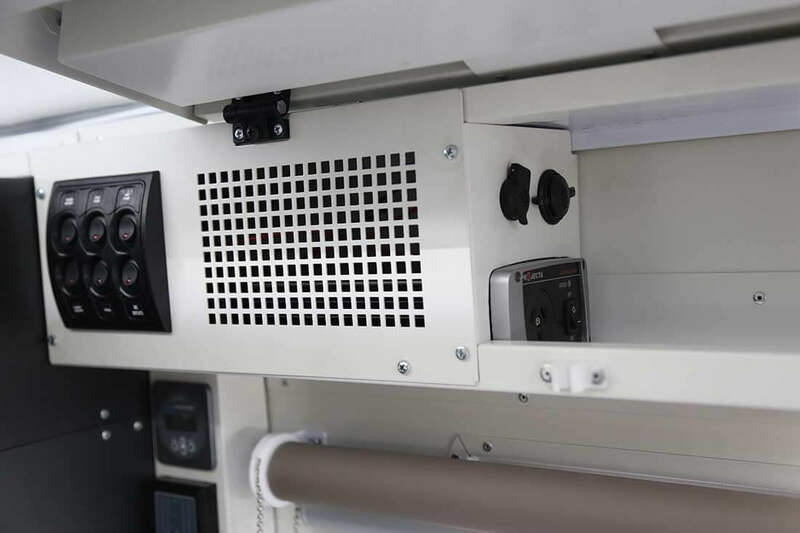 The onboard fridge/freezer can be easily accessed while preparing a meal. 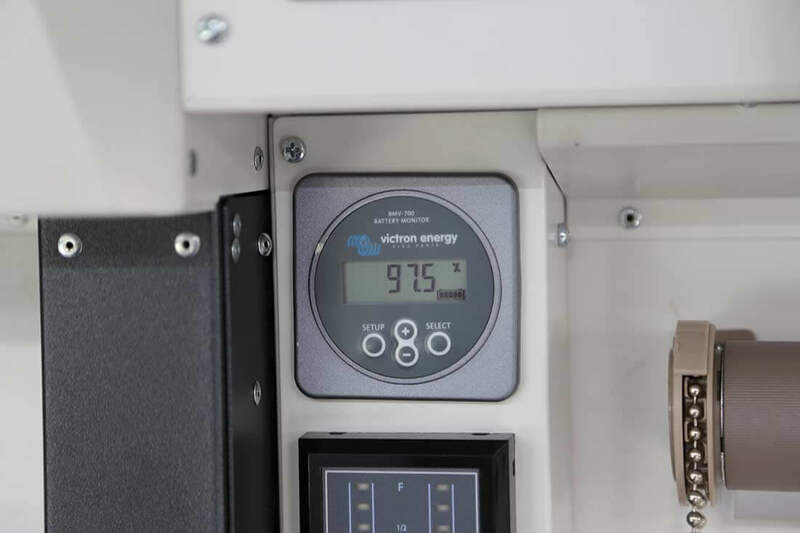 Options for diesel cooking, hot water and heating or combination gas/electric are also available. If you prefer to cook outside, the standard Stainless BBQ is extremely handy, or you can opt for a full external kitchen with twin burners, sink and pantry and cutlery storage. Utilising the full length of the Topaz roof this roll out awning quickly and easily winds out to provide instant shade over the door and BBQ area. 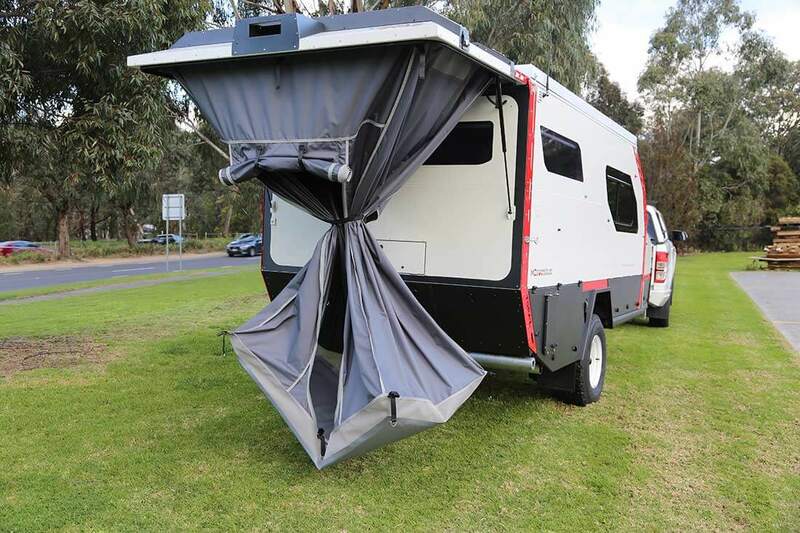 The sail option easily extends the coverage of the wind out awning over the front boot and fridge slide. Its material is light and only takes a couple of minutes to set up. 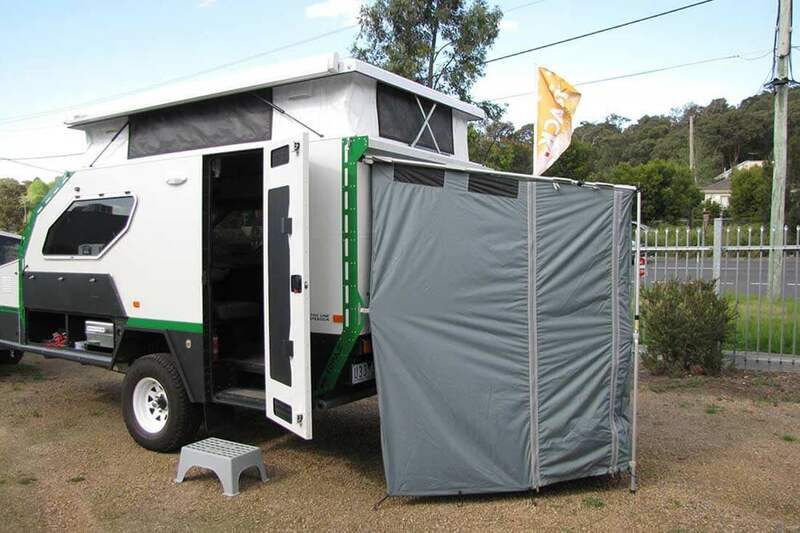 The portable toilet is the perfect solution to the night time need for the toilet without wasting space within the van for a full toilet system. 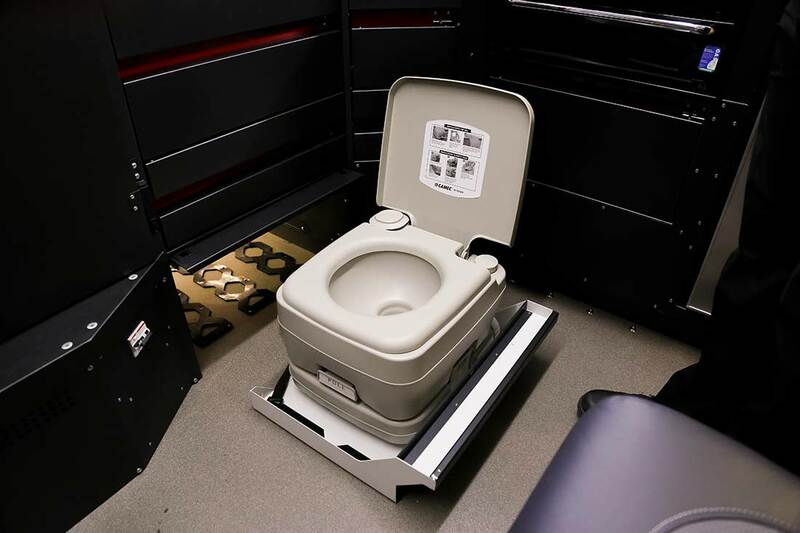 This chemical toilet is internally & externally accessible on a sliding tray so it can be accessed quickly inside the van or emptied at a dump point. 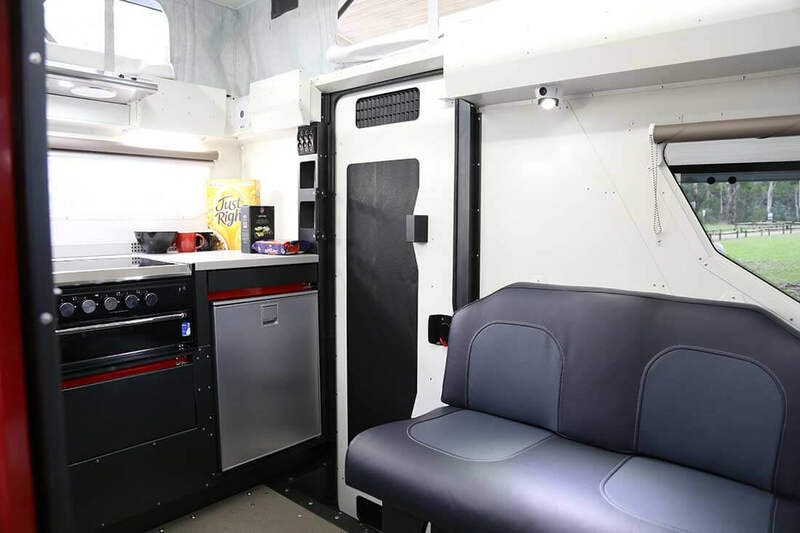 The standard rear tent sets up in 4-5 minutes and provides a private shower space with plenty of room to store the portable toilet for long stays. All new Topaz Caravan / Hybrids come with several different cooking configurations. We can cater for indoors or outdoors, BBQ, full kitchens, gas or diesel. Below are the explanations of each configuration. Standard on the Eyre, Savannah Gas and Silverton. 4 Burner Cook top with safety cut off and solid metal lid. Built in grill and slide out tray. Sovereign Bushman gas BBQ with flat plate. Featuring the three in one – BBQ, Stove top & Oven – quality compact cooking solution with a removable BBQ plate for easy cleaning. Fixed to a Track Trailer slide out tray with folding trays, bottle opener and paper towel, tea towel and rubbish bag holders. 240V microwave secured to cabinetry. Brand of microwave subject to availability. 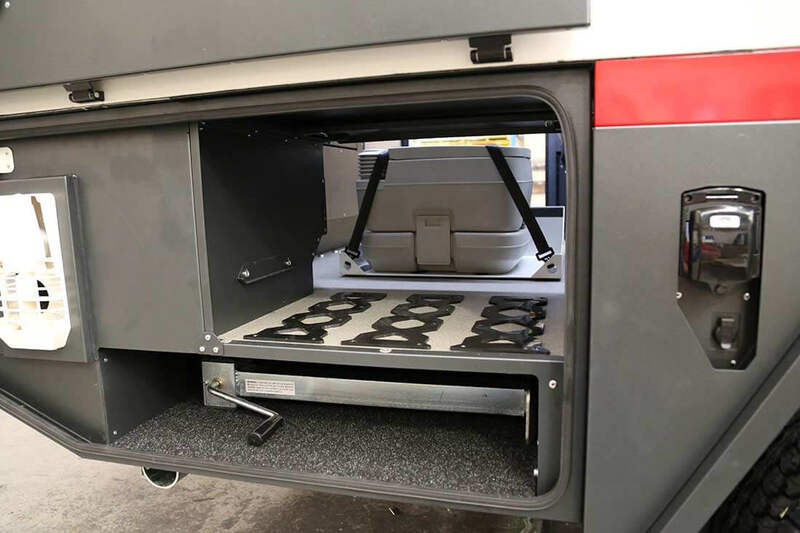 This option is taken from the ever popular Tvan and provides the owner with a simple but incredibly flexible outdoor kitchen. New carcass design (more aluminium) – weight saved! The North / South Topaz bed layout is designed to be a simple answer to the need for more bed space. By removing the wardrobe from the layout and re-distributing the storage in pods that run the length of the bed, Track Trailer can now offer a full length queen size bed or two king singles. If you don’t want the storage pods the mattress can even be supplied as a full king size. Specifications vary depending on model and selected options. 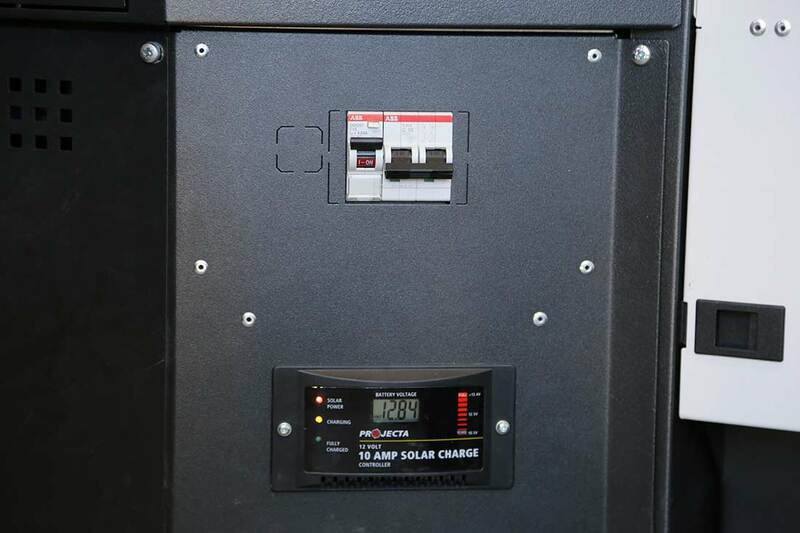 2x 6 switch panel with integrated fusing for lights, stereo, water pump and fans. 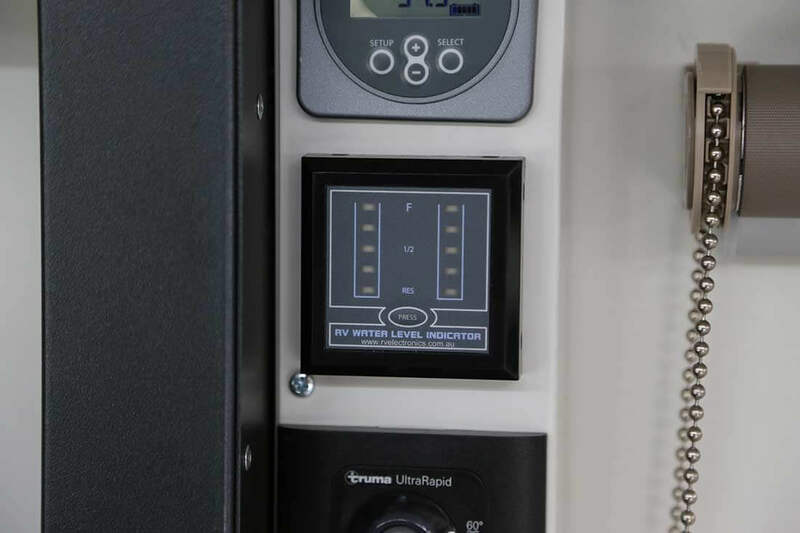 All circuits are protected using built in circuit breakers. What’s Next? – There’s still loads of information!